The April 17 fatal dooring crash of Lenny Trinh in Burbank, CA, has ignited the blogosphere — and the blogosphere is getting it all wrong. Before you read further, please stop. Observe a moment of silence for Trinh’s memory, and for the agony of his family and loved ones. I feel a heavy sadness that this post even needs to be written. But we must address the sober task of learning from this tragedy. Believe it or not, dooring never has to happen. The real tragedy is that door zone riding is so heavily promoted, even after decades of observing the carnage it causes. And the blogosphere is not addressing this tragedy. 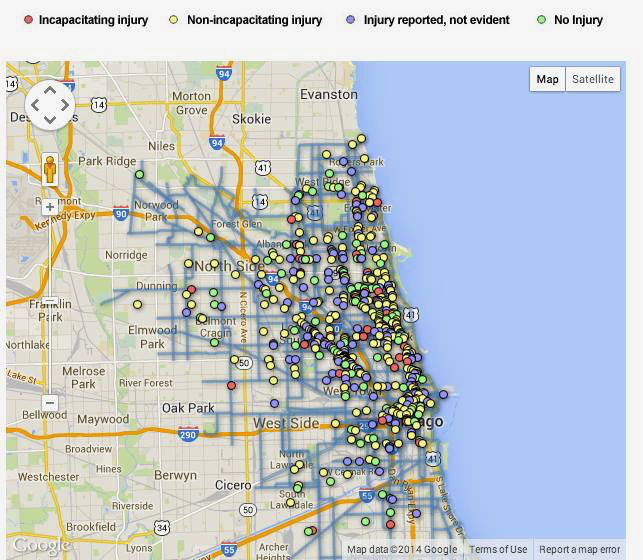 Most dooring crashes aren’t fatal, but some are. Cycling Savvy Instructor John Brooking has compiled a list of 36 fatalities, with names, dates and a narrative describing each crash. As happened last month with Lenny Trinh, most fatalities involve the “doored” bicyclist being run over by an overtaking motorist in the adjoining lane. Why does this happen? The typical scenario is that the bicyclist almost avoids the open door, and her handlebar end catches on the door. 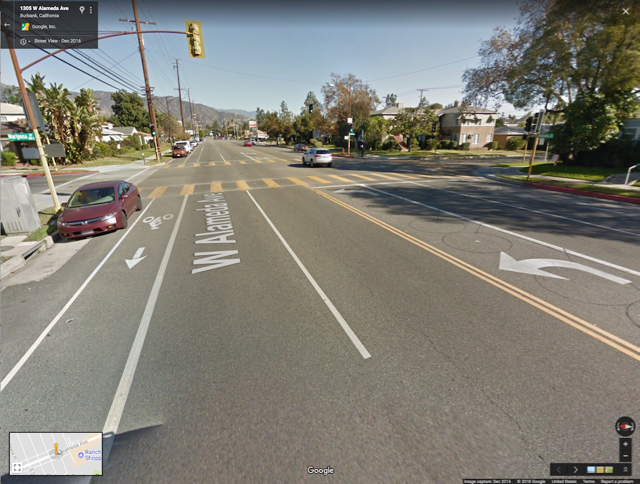 The handlebars swing to the right, which dumps the bicyclist onto the pavement to her left. The nearby overtaking motorist can’t stop in time, and runs over the bicyclist. An overtaking vehicle is not necessary for serious personal injury or death. Instead, the victim hits the ground hard enough to sustain a fatal injury. In at least one case that Brooking recorded, a helmet did not prevent a fatal head injury. This isn’t surprising. If you’ve ever tripped and fallen in the bathtub, you know you can fall fast and hit hard. Add in the bicyclist’s speed, and that’s a faster, harder hit. Non-fatal door collisions are a dime a dozen. Dooring collisions have occurred for decades. They cost millions. And when society believes cyclists should ride in the door zone, dooring collisions create the perception that bicycling has huge inherent dangers that can’t be avoided. What is it with dooring crashes? Why do we have so many? Why do we make so little headway in preventing them? Why do engineers continue to stripe door zone bike lanes, when they know that crashes like Trinh’s are an inevitable consequence of door zone riding? There’s only one way to avoid dooring crashes. Here’s my premise: Safety results from safe behaviors. Traffic control devices should direct all road users to behave safely. A door zone bike lane fails this premise. There is one, and only one, way for a bicyclist to absolutely avoid dooring crashes: Don’t ride in the door zone. So from my point of view, proponents of door zone bike lanes must dispute the premise that traffic control devices should direct all road users to behave safely. Let’s start with the “respect” some people believe bicyclists “deserve” from the rest of society. This “respect” insists that motorists consider bicyclists they haven’t seen, don’t know exist, but may be sneaking up in their door zone. 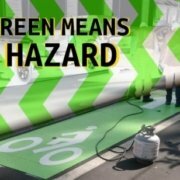 I’ve often heard people say that painting bike lanes green will increase respect and awareness — i.e., that motorists will see the green paint and be aware that a bicyclist might be there. 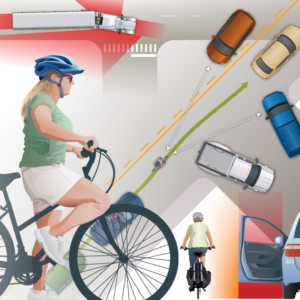 A bicyclist can prevent almost all traffic crashes by changing her own behavior. Awareness didn’t work very well for Ayden Seguritan, a Yale-educated physician’s assistant. She was cycling in the door zone on Harvard Street in Cambridge, MA, and got doored. Then the motorist stepped out of the car. . . wearing her bicycle helmet. The motorist had just finished riding a bike herself. How can you be more aware of bicycling than this motorist? Nope, “awareness” isn’t going to prevent these collisions. Why do some bicycling advocates continue to beat the “awareness” drum — and actually ask for door-zone bike lanes — instead of going for the silver bullet of staying out of the door zone? The biggest is an unwillingness to let go of an assumption: that edge riding is inevitable. What’s edge riding? 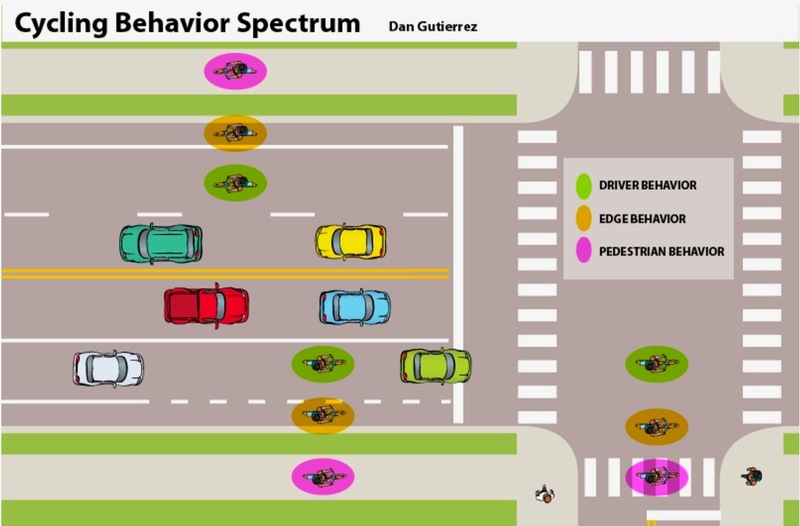 We think of bicyclist behavior as falling into three categories: Pedestrian behavior, edge behavior and driver behavior. A pedestrian-behaving cyclist rides on the sidewalk, and is very susceptible to many crash types. An edge rider, on the right edge of the road, is doing what most people think is safe, but which has its own long list of crash hazards. We all started cycling by being edge riders. And even though edge riding is at the root of most bicycle crashes, many can’t fathom the idea of not riding on the edge of the road. This belief has many roots. One is that many people really still believe that overtaking motorists shouldn’t be inconvenienced in the slightest. (Changing lanes to pass! How difficult! What a first world problem!) It’s distressing how many bicyclists cling to this notion. Another root, found among the jock set, is subliminal: edge riding is difficult and stressful. Jocks like to think that what they do is difficult, and that they are brave for doing it, and they are vaguely threatened by the notion of old grey-haired people blissfully riding in the heavy traffic they fear. A third root is the concept that traffic control devices are promotional tools for bicyclists, not necessarily safety tools. Some bicyclists feel validated when they see a bike lane. It can be horrid — in the door zone, with a gutter seam and sewer grate, a pothole and mountain of broken glass. But by gum, it’s a bike lane, and that says the government loves bicyclists. The whole San Francisco Bay Area features a very extensive network of bike lanes of all kinds — the good, bad, and the ugly. Door Zone Bike Lanes are probably the most common type and all the big local bicycle coalitions support them as ‘better than nothing.’ New ones are still being installed and very few are ever removed. I have tried hard without success to convince the San Jose Department of Transportation to stop installing them but everyone in the department agrees they are ‘better than nothing’ so they keep installing them. This is pretty much true everywhere in the Bay Area — door zone bike lanes are viewed as an improvement even by most bicyclists and somehow most city staff members remain ignorant on the hazards of dooring. Some engineers simply don’t understand the dangers, or think the dangers can be fixed with rabbit’s-foot countermeasures. That doesn’t work. Last month, the city of Key West, FL painted some door zone bike lanes green. 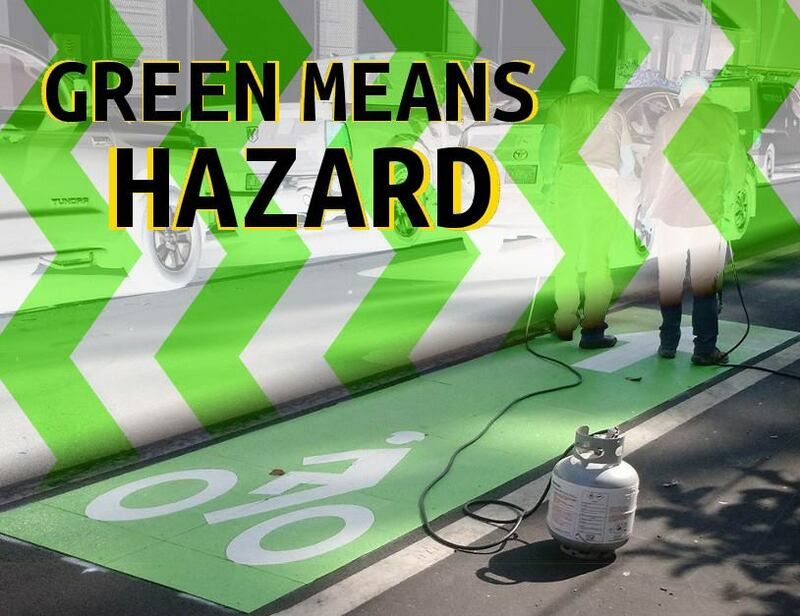 A local cyclist sardonically announced that green was the new “hazard alert” color. But this highlights another problem. You can’t make an unsafe behavior safe with paint. And it doesn’t work to change the color of the paint. The city of Key West would do well to remember what happened when Portland, Oregon tried to make an unsafe bike lane safe. On May 16, 2012, shortly after the city put green paint in the bike lane on SW Madison Avenue, Kathryn Rickson was killed in that bike lane. Rickson’s death was the result of a bad bike lane design. The CyclingSavvy approach doesn’t tell the cyclist to look for validation or personal safety in a politically motivated, poorly designed bike lane. Instead we tell you that your own behavior is what validates you and maximizes your safety. That very thought is alien to many. To some, it’s downright offensive. You heard me right. Some people get offended when you try to tell bicyclists how to ride safer. A surprising number of people prefer to view bicycle crashes as either (a) completely random, or (b) the fault of someone else. These beliefs fuel the society-wide opinion that bicycling has huge risks that can’t be managed. They’ve contributed to an overall decline nationwide in cycling. Shouldn’t there be a law? Well, there usually is. State laws typically find a motorist at fault for opening a car door and causing a crash. But the abysmal compliance with that law should convince you to neither rely on it nor tell other cyclists to rely on it. [A] person exiting an automobile would not reasonably expect that a cyclist would be traveling at a rapid speed within a foot of her car. Accordingly, one could not conclude that a reasonable person should believe that cracking the car’s door no more than six inches would cause a cyclist to veer into a lane of moving traffic. The judge ruled against the bicyclist (Wing v. Schmidt, September 1980). Now it’s time to return to Mr. Trinh’s tragic case and the blogosphere. The countermeasure that bloggers have most often suggested is something called the Dutch Reach. This is a campaign to get motorists to reach across the steering wheel with their right hand to open the car door. The belief is that this will naturally cause motorists to look out for overtaking door zone bicyclists. I eagerly await the day when it becomes common knowledge that bicyclists are better served by simply riding outside of the door zone. 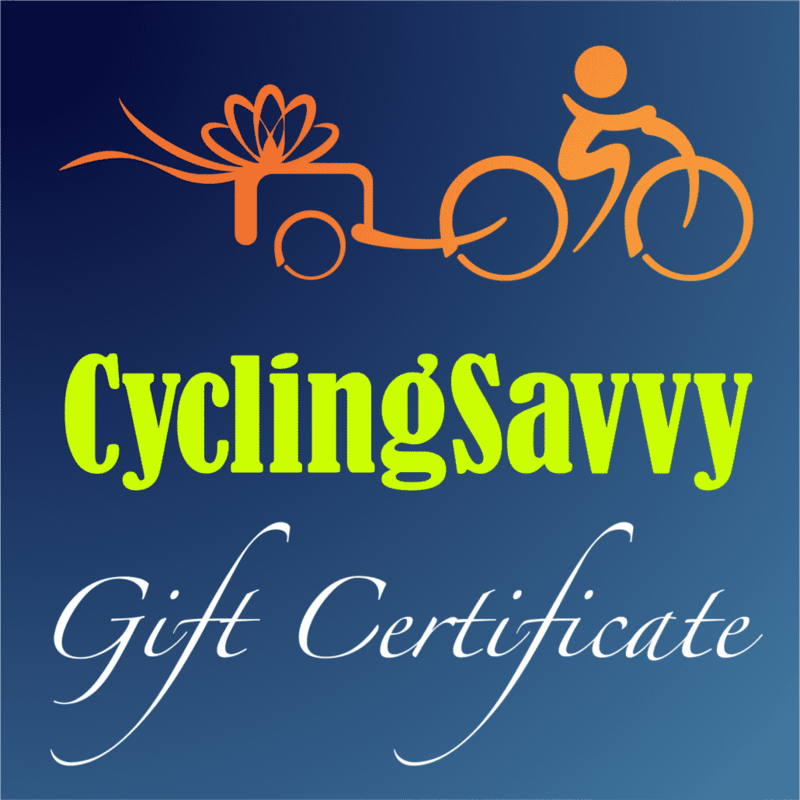 A few months ago I led a CyclingSavvy group on a tour of Philadelphia. We were controlling the right travel lane on Spring Garden Street, staying outside of the door zone bike lane. An overtaking motorist — who was not inconvenienced, even for a second, in changing lanes to pass — told us to get in the bike lane. And just like that, a Toyota Prius door flung open in the bike lane. We weren’t in danger. We didn’t care. We were riding safely. Friends don’t let friends ride in — or promote — door zone bike lanes.